You’ve gotta try this fun zucchini recipe! Little boats that you can eat…how cool is that? 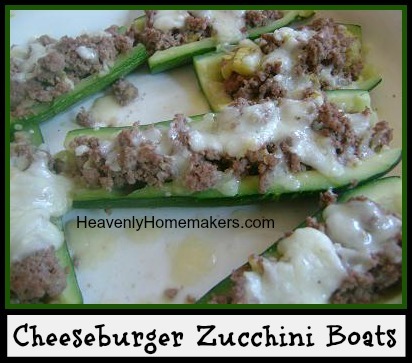 What a perfect way to get your kids to eat zucchini! Cut off the ends of the zucchini and boil them for about 10 minutes. In the meantime brown hamburger meat, onion, garlic powder and chili powder. Salt to taste. Use a fork and spoon to scrape out the “zucchini guts” (sorry, I live with boys) and add it to cooked hamburger meat. Scoop equal amounts of hamburger mixture into each “boat”. Top with shredded cheese. Put in oven broiler for a couple of minutes until cheese is melted then serve right away. Or…you can skip the sing-along and just eat them. What catchy, well-known tune is that little ditty sung to? I may serenade my family tonight. I could make up my own little melodic rendition. I love adding shredded zucchini to hamburger while it’s browning when I make tacos or taco lasagna. My non-veggie eating husband doesn’t complain at all, even though he knows it’s there because I shred mine whole with the skin on and everything. Sometimes I add shredded carrot too. I do the same thing except I add spag sauce or a can of tomatos to the hamburger as well- yum!!! Keli – I am so with you there! I sometimes ask if he wants any salad with his Ranch! I believe I’ll try these for lunch today! Thank you so much… I was needing some more zucchini recipes. Zucchini is sticking out our ears!!! Would these be good using yellow squash as well? Sounds great! I would imagine so but I’ve never tried. If you do try…let us know how they turn out! These are awesome! Everyone loved them so much the first night that I had to make them again the next night! I also loved at how little time it took to make them! No, but what a good idea! sauce, but my little one and I really enjoyed it with the sauce! Dipped in sauce! Maybe even with a side of garlic breadsticks. It has been a better than usual year here for zukes…And in western Washington that is saying something! Here’s a time saver tip: I found using a grapefruit spoon with a serrated tip works great for “gutting” the zucchini. My family doesn’t even notice the zucchini for all the other flavors going on in their mouths…. This might be a dumb question but how small is “small” zucchini? Can you give a pound amount or length like 8 inches etc? We bought some local zucchini and have been loving trying new recipes with it! So far I have made chocolate chocolate chip zucchini bread and muffins, a chocolate birthday cake with zucchini in it( no one could even tell and no one knew until I told them) and cheesy zucchini rice :)!